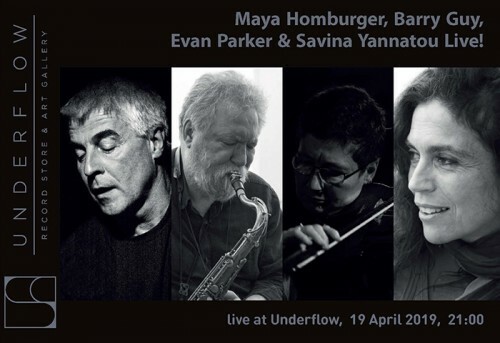 Maya Homburger, Barry Guy, Evan Parker & Savina Yannatou live at Underflow, April 19 2019. Maya Homburger is a classically trained violinist, working in the context of free improvised music. For the past 30 years she has devoted her time exploring and developing her personal style on the baroque violin as well as managing the Barry Guy New Orchestra, the London Jazz Composers Orchestra and running her own CD label MAYA recordings. Evan Parker is a British saxophone player and a European free jazz legend. He has performed and recorded with a wide range of artists, including Peter Brötzmann, Cecil Taylor, John Zorn, Scott Walker and Robert Wyatt. He has been instrumental in the development of free jazz and improvised music in Europe, and he has pioneered a wide array of extended techniques in the saxophone. Savina Yannatou is a highly regarded singer and songwriter from Greece, with a keen interest in exploring free jazz and avant-garde music. Her vocal techniques include throat singing, glossolalia and ululations among others. She is currently signed on ECM Records.